Alberta-based companies have donated more than $2 million to the Premier Brad Wall's Saskatchewan Party over the past decade, according to a new database compiled by a left-leaning advocacy group. Alberta-based companies have donated more than $2 million to the Saskatchewan Party over the past decade, according to a new database compiled by Progress Alberta, a left-leaning advocacy group. Progress Alberta executive director Duncan Kinney said he started compiling the data after listening to Saskatchewan Premier Brad Wall's speech to the Calgary Petroleum Club in June. "No one in the media really clued into why he was giving a speech at the Calgary Petroleum Club to an audience of Alberta-based oil and gas people," Kinney said. "It was a fundraiser," he said, metaphorically referring to potential fundraising opportunities. Premier Wall didn't get paid to speak at the Petroleum Club nor did the Saskatchewan Party receive any proceeds from the event. After compiling the data, using publicly available political donation records dating back to 2006, Kinney noted Wall is "an extremely successful out-of-province fundraiser." Over the past 10 years, the party received $12.61 million from nearly 9,000 separate corporate donations, according to the database. Of that, $2.87 million came from companies outside Saskatchewan, and $2.02 million came from Alberta-based companies, specifically. Kinney noted Alberta-based donations included hundreds of thousands of dollars from companies in the oil and gas sector — an industry that Wall has enthusiastically aligned himself with. In his June speech to the Calgary Petroleum Club, the Saskatchewan premier referred to himself and the industry as "we" and "us" and said the sector needed to be defended from what he deemed an "existential threat" from the likes of Hollywood stars, proponents of the Leap Manifesto and universities, churches and public pension funds looking to divest from fossil fuels. "We are in the middle of a battle and, frankly, we haven't been winning very many battles," Wall told the industry crowd. "When I say 'we,' I mean this sector and the resource importance of Western Canada." Duff Conacher with Democracy Watch said he's concerned about possible political interference. "When you look at who's been funding the Saskatchewan Party, it's, I think, an undemocratic and unethical vicious circle of Alberta oil and gas companies supporting a party that's outside the jurisdiction so that the leader of that party can come to Alberta and make speeches that push their oil and gas company agenda forward, which is just not something that should be happening in any jurisdiction that should be calling itself a democracy," he said. Conacher thinks corporate donations should be banned in Saskatchewan — as they are in Alberta — and that individual limits should be lowered. There is no cap on donations in Saskatchewan. "Every voter in Alberta should be concerned about anyone coming from outside the jurisdiction and trying to influence the political decisions of their government," said Conacher. "Especially a premier that's coming, in part paid for by money raised from corporations in Alberta that don't necessarily have the overall public interest in mind, and a premier from another jurisdiction who likely also doesn't have the overall public interest of Albertans in mind in terms of what he says when he's there." 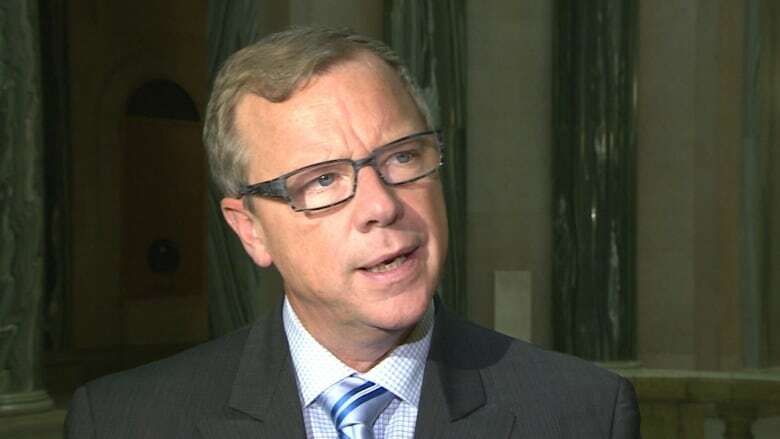 Brad Wall, speaking to reporters in Saskatchewan, said he's not concerned about the province's political donation rules and said there are no plans to make changes. He said a new lobbyist registry is the best way to ensure accountability in the government. "You know, we just came through an election campaign, and I can honestly say I didn't have one voter raise it, so probably not. No plans right now for any changes," said Wall. He said resource companies "that are employing thousands of people in Saskatchewan may want to participate in democracy" and that unions may want to as well.